The Var is a department in the Provence-Alpes-Côte d'Azur region in Provence in southeastern France. It takes its name from the river Var, which used to flow along its eastern border, but the border was moved in 1860. Its prefecture is the city of Toulon. Var is one of the original 83 departments created during the French Revolution on 4 March 1790 with Toulon as is capital. It was formed with part of the former province of Provence. It was divided in nine districts: Toulon, Grasse, Hyères, Draguignan, Brignoles, Saint-Maximin, Fréjus, Saint-Paul-lès-Vence and Barjols. The capital was moved, in 1793, from Toulon to Grasse and, in 1795, from Grasse to Brignoles. In 1797, the capital was moved again, to Draguignan. In 1800, with the creation of the arrondissements in France, the nine districts were changed into four arrondissements: Brignoles, Draguignan, Grasse and Toulon. On 15 June 1860, the arrondissement of Grasse passed to the new department of Alpes-Maritimes. With this change, the Var river does not flow any longer through the department named after it. On 10 September 1926, the arrondissement of Brignoles was eliminated but in 1974 Brignoles was made again an arrondissement and the capital was moved from Draguignan to Toulon. The Var is the only French department that has had four different capitals: Toulon, Grasse, Brignoles and Draguignan; now Toulon is the prefecture (capital) and Brignoles and Draguignan are subprefectures. Grasse is now a subprefecture of the Alpes-Maritimes department. During World War II, the department was occupied by the fascist Italy, from November 1942 to December 1943. In 1944, the German army occupied the territory of the Var department. Var is part of the Provence-Alpes-Côte d'Azur region. It has an area of 5,972.5 km2 (2,306 sq mi). It also borders the Vaucluse department, to the nortwest, but only for a very short distance. The highest point of the department is Mont de Lachens (43°44′51″N 06°39′42″E﻿ / ﻿43.74750°N 6.66167°E﻿ / 43.74750; 6.66167﻿ (Mont de Lachens)) with an altitude of 500–505 m (1,640–1,657 ft) high. ; it is in the commune of Mons in the northeast of the department near the border with the Alpes-Maritimes department. The Îles d'Hyères is a group of three islands off Hyères. 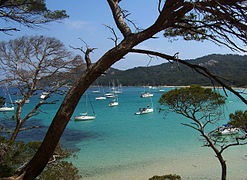 The islands are named Porquerolles, Port-Cros, and Île du Levant. Together, they make up an area of 26 km2 (10 sq mi). They can be reached by boat from either Hyères or Toulon. The Köppen climate classification type for the climate at Toulon is a "Mediterranean climate" and of the subtype "Csa". The average amount of precipitation for the year in Toulon is 678.2 mm (26.7 in). The month with the most precipitation on average is November with 86.4 mm (3.4 in) of precipitation. The month with the least precipitation on average is July with an average of 7.6 mm (0.3 in). The average temperature for the year in Toulon is 16.1 °C (61.0 °F). The warmest month, on average, is July with an average temperature of 23.9 °C (75.0 °F). The coolest month on average is January, with an average temperature of 9.4 °C (48.9 °F). 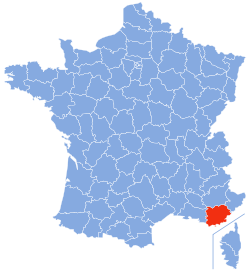 Var is managed by the Departmental Council of Ardennes in Toulon. The department is part of the Provence-Alpes-Côte d'Azur region. There are 3 arrondissements (districts), 23 cantons and 153 communes (municipalities) in Var. Var had a population, in 2014, of 1,038,212, for a population density of 173.8 inhabitants/km2. The arrondissement of Toulon, with 565,669 inhabitants, is the arrondissement with more inhabitants. The beach of la Courtade in the Iles d'Hyeres. ↑ "Les conseillers-départementaux" (in French). Conseil Départemental du Var. Retrieved 19 July 2017. ↑ 2.0 2.1 "Département du Var (83) - Résumé statistique". Publications et statistiques pour la France ou les régions (in French). Institut national de la statistique et des études économiques - INSEE. Retrieved 18 November 2016. ↑ 4.0 4.1 4.2 4.3 "Historique du Var". Le SPLAF (in French). Retrieved 18 November 2016. ↑ "Mont de Lachens, France". Peakbagger.com. Retrieved 18 November 2016. ↑ "Toulon, France - Köppen Climate Classification". Weatherbase. Retrieved 18 November 2016. ↑ "Département du Var (83)". Géographie administrative et d'étude (in French). Institut national de la statistique et des études économiques - INSEE. Retrieved 19 July 2017. ↑ 8.0 8.1 8.2 "Régions, départements, arrondissements, cantons et communes" (PDF). Populations légales 2014 (in French). Institut national de la statistique et des études économiques - INSEE. Retrieved 19 July 2017. ↑ "Département du Var (83)". Comparateur de territoire (in French). Institut national de la statistique et des études économiques - INSEE. Retrieved 19 July 2017. ↑ "Décret n° 2014-270 du 27 février 2014 portant délimitation des cantons dans le département du Var" (in French). Légifrance.gouv.fr. Retrieved 18 November 2016. ↑ "Habitants du départment: Var (83)" (in French). habitants.fr. Retrieved 18 November 2016. This page was last changed on 12 November 2017, at 23:55.